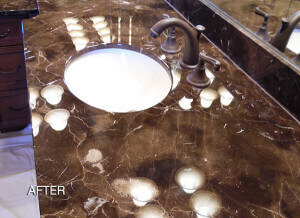 We know natural stone and we know how to get it (and keep it) looking its best. 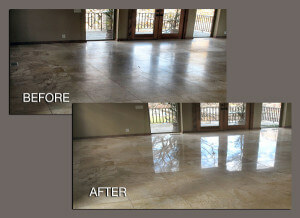 Whether you have scuffs, stains, dull spots, scratches, etch marks (from acid damage), chips & cracks, or other damage to your marble, granite, travertine or other natural stone, see what our services can do for you. Tile and grout looking dirty, dull or lifeless? 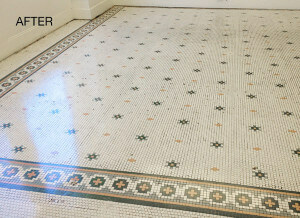 Grout stained, cracked, or just plain missing? 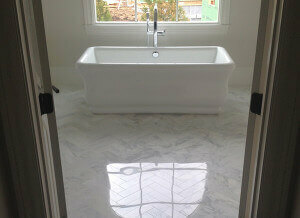 We can deep-clean your tile, restore, clean and seal or even color seal your grout. Your tile and grout floors, showers, countertops, utility rooms and more will be looking tip-top again in no time! RESTORE IT TO LIKE NEW! You made a big investment when you installed those natural stone or tile and grout floors, countertops, reception areas, entryways, bathrooms and more. Seeing them less than first-day fantastic can be discouraging, but we’re here to perk you up. Chances are excellent that, even if they’re looking pretty bad, your natural stone and tile and grout surfaces don’t have to be replaced, as you might have feared. What they really need is an experienced and knowledgeable cleaning and restoration professional to whip them back into shape and help them shine like new all over again. You can trust Tennessee Stone Care to do just that. And we won’t get your home or facility looking great again, just to leave you hanging. We pride ourselves on our ongoing maintenance services and solid customer education in the best care methods and products for your floors, countertops, hallways, walkways, pool surrounds, and so much more. We want you as a customer for life! Our friendly experts are readt to discuss your needs and answer any questions you have. We are stone and tile experts. Marble polishing, honing travertine, sealing granite or other countertops, deep cleaning and sealing or color sealing your grout, repairing chips and cracks… We’ve done all this and more for years! If you are in Nashville, Chattanooga, Memphis or anywhere in Tennessee, we hope you’ll allow us to perform these services for you. You’ll be glad you did! See for yourself why our customers are consistently pleased with the quality of our work. Case studies are basically pictures of actual jobs we’ve done, along with stories that explain the problem, our solution, and any challenges we experienced along the way. The best part is that they always have a happy ending. According to my son, John's work made my countertops feel so soft! His granite knowledge is impressive and his products help keep my counters clean and "soft."